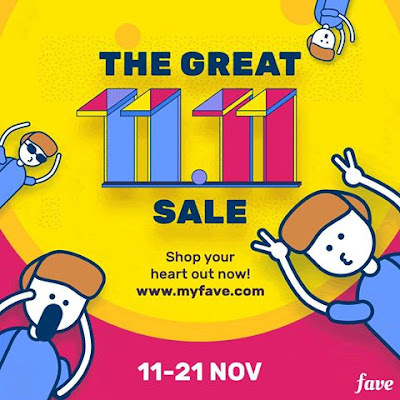 🎉 The Great 11.11 Sale Is Here! 🎉 Are you ready to shop your heart out for 11 straight days? Here’s your chance to enjoy the best offers in town at the greatest prices! The greatest sale is here! Expect big discounts on better-than-ever offers from November 11th to November 21st, 2017! The 11-day sales period is your chance to go all out and treat yourself and loved ones to the best offers in town without breaking the bank 😉. On top of irresistible discounts, get ready to enjoy the best of all categories with exclusive collections. We have everything for everyone - whether you’re a foodie, adrenaline-junkie, working individual who needs to de-stress, or a family man. We’ve got you covered! Are you a busy bee and want to look for deals on-the-go? Don’t fret - our big sale will also be available on the Fave app! All you have to do is fire up the app during the sales period and find whatever suits your needs. Prepare to shop your ❤️ out!